Farewell to Flesh was a two-part performance and installation held at Kenkelaba House for the opening of a show by NYC artists born or raised in locations where carnival in celebrated. Part I, Dressed as a colorful, seven-foot-tall carnival character, Alyson Pou circulated through the crowd giving out good-luck charms, holding conversations, telling stories and encouraging those she encountered to follow their dreams. 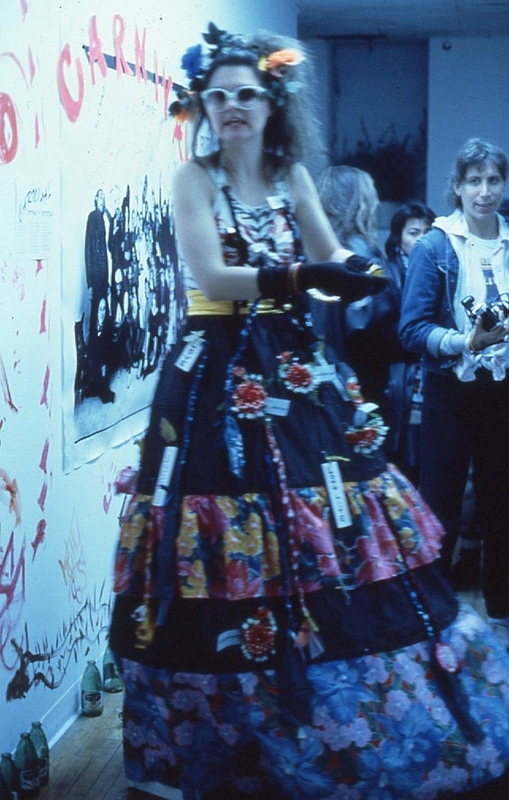 She did this because carnival is one of the few western rituals that allows its participants to change or transform. If only for a few hours, the participant’s worldly identity is altered and there is the knowledge that anything is possible. 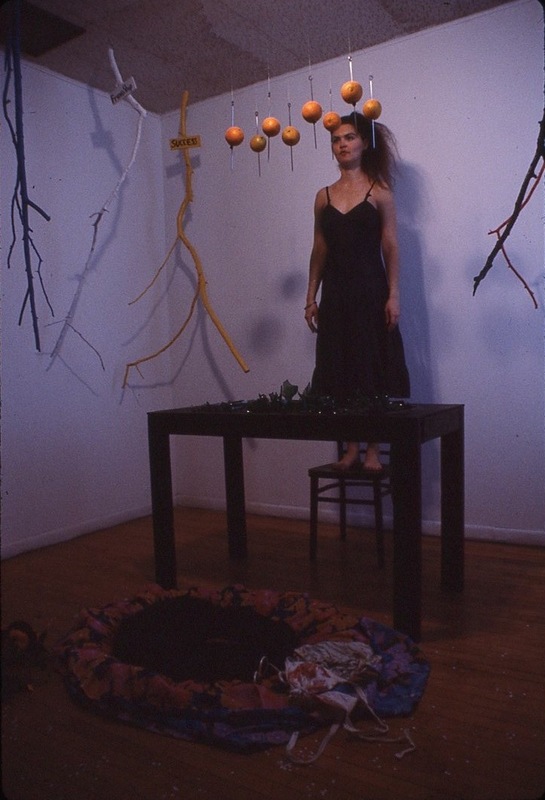 In Part II, Pou sheds her carnival costumes, climbs up on a chair behind a black table covered in green glass and delivers a monologue about images noted and recorded on the walk from the Upper East Side to 2ndAvenue and Avenue C, where the performance took place. 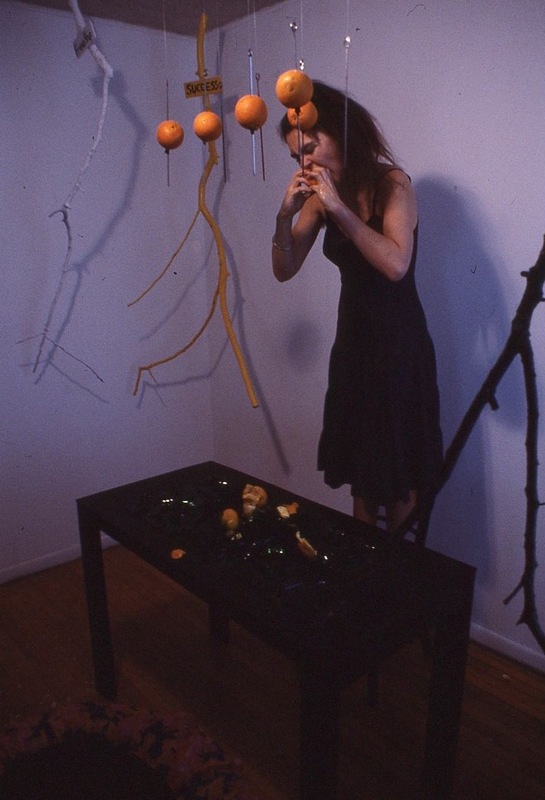 She ends the performance by tearing open the oranges, which are hanging from the skewers over a table, eating them and dropping the remains to the table-top covered in broken glass. This act was a reference to the literal translation of the Latin, ‘carnevale’, which means “farewell to flesh”. Using the ritual feast before the fast to point out extremities and contrast the excesses of wealth and poverty and touch on more political aspects of carnival as an instrument to keep the “people in their place”, i.e. using carnival as an annual safety valve.